The twin driving forces of the relentless activity of Sparsh Foundation of Ahmedabad for social causes are compassion and passion. Two exceptionally gifted persons, Namrata Shodhan and Darshana Thakkar, both full of energy and always brimming over with imaginative ideas, never seen not wearing a smile, invest the activity with life. One has the voice of a nightingale, the other has words of joy rolling off her tongue. One seems to have been born with a silver spoon in her mouth, the other with her gynecologist skills seems capable of minting money. The two, truly twosome on stage, sing and speak endearingly. Incredibly, they donate all the huge donations they receive for the show and CDs and DVDs, minus cost, to needy kidney patients on dialysis due to kidney failure. This is being written after attending one more (18 Aug) of their live shows held at Ahmedabad Management Association Hall from time to time. 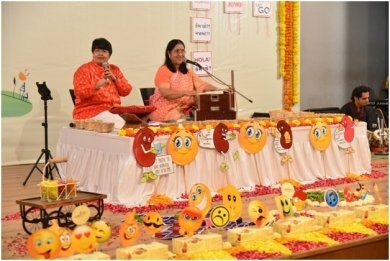 Waves of the melodious music one presented and the fragrant air the other created with words, made light with humour and the warmth of bonding, swept the listeners with emotions as they went up to the last row of the packed hall. The name given to the show based chiefly on Gujarati poetry is Sambandho ane Samvedana (Relationships and Feelings). The objective is to sensitize the listeners and spread awareness regarding the finer human feelings and to get them to empathize with others. The duo has developed a knack of weaving singing and coordinating words together with a common thread. Initially there was a lullaby Lalla lalla lori doodh ki katori with a moving folklore touch, which the singer rendered eyes closed as is her wont getting one with the swaras and the bhava the song conveyed. The compere, all smiles, takes the opportunity to stress the significance of the best of human relationships between the mother and the child in her lap. The mother, she says with a complete rapport with the listeners, can sing even nihshabd, sing a nonverbal song in silence. The child listens, appreciates it and instantly goes to sleep! Words, like singing, can build bridges. See the magic of love! 'At your glance, even a blade of grass grows into a mountain,' is the line of a poem sung. Taking a cue, the compere remembers another poet's line, 'I will fetch water with the pot of relationships.' She goes on to say, 'You are close to God when you invest a nameless relationship with love.' The singer had earlier reminded everyone in a song that the human body is but a rented house for the immortal soul with its unique sensibility having the capacity to feel for others within. The ambience at the music concert for a cause played no mean role. Right at the steps leading to the entrance were floral designs with smiley faces that lightly suggested ways to lead a healthy life. On the vast backdrop to the stage inside were FB symbols and words signifying human emotions, which were occasionally casually explained. The space in front of the performers otherwise remaining empty came alive with flower designs, emoticons, symbolic representations and even a couple of health tips and appeals for donations in small letters, all pleasingly integrated. A significant one was a bamboo basket on a toy carriage with glassfuls of water and flowers. Its significance was seen when this lyrical line was recited: vaans-ni kari chhabadi emaa-n... 'Grief is gently pushed away floating in a bamboo basket'. 'In music is man revealed,' Rabindranath Tagore has pithily said. A soothing sparsh of the Sparsh Foundation has supported thousands of dialysis patients in twenty years. A hush with eyes moist greeted the courageous young man Mangesh Kamble, an NID student, to undergo kidney transplantation two days after the event, to whom it was dedicated. He came on to the stage and lovingly with a smile introduced his three mothers, two of them on the stage.